The North West Premier Business Fair is brought to you by Made in Bury in association with thebestofbury. The Made in Bury Business Awards are championing local Bury businesses and celebrating their outstanding achievements. 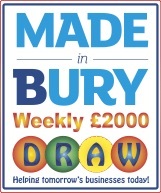 The Made in Bury Business Academy is a funded initiative delivered by Made in Bury Limited, sponsored by Bury Council and thebestofbury. The Academy offers workshops and on-going support for Bury businesses who have been trading for under two years. Made in Bury Brunch Club is an exclusive, women's only business networking organisation, designed to offer support and help build connections for women professionals.